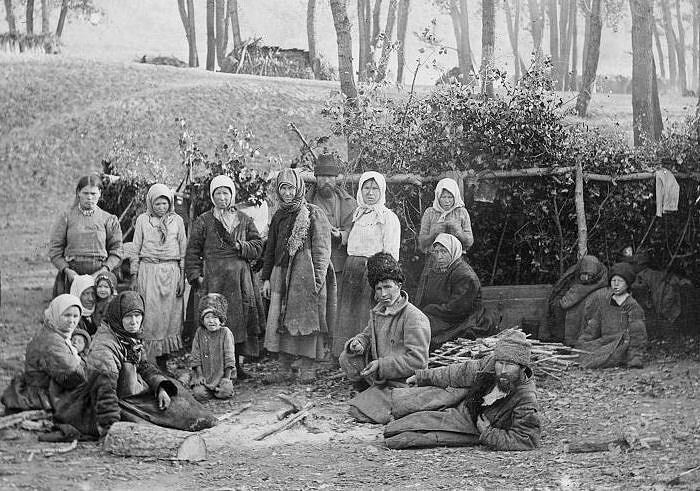 Russian peasants in the early 1900s. Peasants were political game changers in 1917. They defined politicians’ responses to national challenges; they produced, controlled, and dictated food supplies; armed and uniformed peasants served as soldiers, making and breaking political power; and, as the majority of Russia’s urban residents, they played key roles in urban uprisings. Yet when we talk about peasant revolutions, we usually mean the rural battles over land use and ownership. And, though more than 80 percent of Russia’s population lived in non-urban areas in 1917, scholars often marginalize peasants’ experience of, and participation in, the Russian revolution, focusing instead on urban labor and the intelligentsia. The diversity and complexity of rural uprisings dispel any assumptions we might have about the nature of peasant action. They also reveal the revolution’s extraordinary creativity and transformative nature. Peasant uprisings defy easy definition. As they spread across 1917 temporally and geographically, they took forms as diverse as the Russian Empire’s vast territory. Often, the quality of the land and the local culture determined the shape of these uprisings. While most people imagine violent attacks on landowners and the forcible seizure of estates, many rural struggles unfolded peacefully. Violent confrontation attracts the most attention but entails huge risks for its participants. Most of Russia’s peasants undertook quiet and measured action, although it probably did not feel that way for those whose property was redistributed. Some peasants engaged in surreptitious revolt by simply opening a gate and allowing the village livestock to graze on a landowner’s meadows. Some communities produced official looking documents that granted them the use of local resources in perpetuity. More brazen uprisings saw villagers working together to clear timber from a neighboring forest. Unfortunately, we don’t have a full account of all the ways that rural workers contributed to that revolutionary year. What we know demonstrates a range of tactics, actors, and goals, all of which would play a decisive role in Russia’s post-revolutionary state. The term peasant usually refers to people who lived and worked in rural areas, but, in Russia, it also described a legal category — soslovie — which even appeared on an individual’s passport. Russian peasants could live in urban areas, make their living as workers or traders, and serve in the military. In the early twentieth century modernity arrived in rural Russia, coexisting with and transforming the traditional elements of peasant life, defined by patriarchy, religious orthodoxy, and communality. Patriarchal power structures ensured that older men dominated both family and community. The Russian Orthodox faith played an important role in social, cultural, and spiritual life for many residents. Communal systems of land management endured in many areas, facilitating the collective use of resources and reinforcing patriarchal social structures. All these features lent rural Russia a degree of parochialism, and politics emphasized local interests over national concerns. Modernity challenged these traditional patterns in a number of ways. After the 1861 emancipation of serfs, primary education in the countryside accelerated, bringing literacy to the younger generation. Meanwhile, millions of people migrated seasonally to urban centers and returned with metropolitan ideas and customs, including secularism and consumer culture. Elected local governments and regional courts offered the rural population new ways of communicating with the state, which they took up with gusto. After the 1905 revolution, peasants turned out for national elections and vociferously petitioned their regional representatives. Finally, the 1914 mobilization heralded a significant change among village men who took up arms — some with patriotic fervor and others with great reluctance — and moved across the great empire. These connections to the world outside their own villages meant that, by 1917, peasants no longer lived in isolated pre-modernity. They related to the state and the nation in multiple ways. Rising literacy rates allowed the peasantry to engage with national and regional political agendas while experiences in urban centers inspired young people to challenge male elders’ patriarchal dominance. These words, spoken by a sailor-agitator at a June 1917 meeting in Kazan, capture the most fundamental element of revolutionary peasant aspirations. The clear statement that land and wood, like air and water, belong to those who need them was often repeated in the revolutionary year and beyond. In areas once dominated by serfdom, former serfs harbored deep resentments about the unequal emancipation settlement. Land seizures were most likely to become violent in the areas where peasants had hostile relationships with local landowners. What we know of the shape and intensity of rural revolutions comes largely from the so-called disturbance reports compiled primarily from private landholders’ complaints. These reports tell us that the parts of Russia with the most fertile soil witnessed the most disturbances. They also indicate that areas with high concentrations of serfdom also saw more unrest, more violent attacks on individual landowners, and more forcible seizure of estates. These statistics do not provide a complete picture of the rural uprisings, however, because they only recorded a particular type of action. Although violent assault and forced redistribution often exemplify the peasant revolution, they were not at all typical. In fact, by 1917, only a small proportion of arable land still belonged to the elite. In some regions, like Viatka, noble landlords and land hunger were mostly absent. The February revolution launched a steady unfurling of peasant aspirations and actions, but how rural revolutionaries struggled for equality depended on their locales’ land use and ownership patterns. Most of these actions did not involve violence or forcible seizures. Instead, rural communities tested and transgressed the laws of private ownership while trying to protect themselves from potential repression. For example, the peasants of Aryshkadza village simply announced that they would sow the local landowner’s fields for winter grain and that his employees had one day to get off the land. The workers left, and the villagers planted. Further, we shouldn’t consider these peasant revolutions a class-based phenomenon because the peasantry did not form a coherent class. That said, peasants did broadly define themselves as rural working people, which framed their worldview and their actions. Some peasant revolutions saw communities acting collectively against landowners in ways that look like class-based uprisings, as the oppressed struggling against their oppressors. But many others saw contestations over land use between neighboring communities or between individuals. For example, villagers often targeted peasants who had chosen to work individual farmsteads rather than communal land and forcibly drew them back into community farming. The whole village usually carried out these attacks, seeking to reintegrate the individualist farmer and his land. Villagers had significantly different levels of wealth and clout, but these rankings were neither fixed nor sustained — individuals moved both up and down their local hierarchies. Meanwhile, the central government supported the private landowners’ complaints and ordered rural communities to respect private property. But they had no way of enforcing these orders, so 1917 saw ever-escalating transgressions on private property. Who Led the Rural Revolutions? We have only fragmentary evidence about the individuals and groups that led peasant revolutions. Committees, soviets, and unions assumed leadership in many villages, issuing orders about land use and management. These organizations offered an institutional basis for peasants’ actions. A range of evidence indicates that only people integrated into the peasant community took power. The so-called village intelligentsia — teachers, doctors, agrarian specialists, and clergymen — were systematically excluded from elected offices and generally didn’t appear in accounts of rural revolutions. Election records indicate that villagers preferred literate, sober, sensible, and trustworthy candidates who also belonged to the peasantry. The diversity of action that constituted the peasant revolutions, however, means that we cannot typecast its leaders — some rural revolutions drew in the whole village community, women led some, and a handful of wealthier villages led others. The February Revolution transformed the status and power of ordinary soldiers, who became the movement’s armed protectors. Deserters, soldiers on leave, and men stationed in rear garrisons all played lively roles in village politics. They were the closest any outsider, if we would categorize them as such, got to leading the peasant revolts. Because soldiers were exposed to, trained in, and equipped for violence, rural revolutionary activity was more likely to turn violent when soldiers participated. Sometimes the whole community participated in these assaults. For example, a crowd of soldiers accompanied by village women and their children forced Natalia Neratova off her land in May 1917. At the beginning of the revolution, party politics still played a marginal role in peasants’ activities. Viktor Chernov’s Socialist Revolutionary Party had developed a strong base of rural support, particularly in Russia’s central heartlands, as demonstrated in the November Constituent Assembly elections. Nationally, the Socialist Revolutionary Party won 37 percent against the Bolsheviks’ 23 percent, but these figures obscure the former’s dominance in some regions. It won 76 percent of the vote in the northern regions and 75 percent of the vote in the Central Black Earth region. The party had capitalized on its image as the party of peasants and on its strong local affinities to secure electoral support, but it did not lead the rural revolution. Party activists only took on leadership roles in villages if they embraced the desires and motivations of those communities. The rural revolutions exposed the national and regional authorities’ powerlessness. Neither the Provisional Government nor the Petrograd Soviet addressed peasant concerns and demands. They asked the rural population to wait patiently for the Constituent Assembly to enact land redistribution. Peasants largely ignored these appeals, and the central government couldn’t prevent their actions. Regional authorities started 1917 with the belief that rural revolutions emerged from misunderstandings and assumed that conciliation and education would halt disturbances. By that summer, the self-conscious assertiveness of rural communities who sought to make their own revolutions without recourse to central plans had eroded these beliefs. Regional authorities increasingly relied on armed force to control rural areas. A handful of more perceptive leaders tried to control the peasantry by preemptively authorizing the transfer of privately held land to local committees. But the uprisings continued unabated because no central or regional power could implement any policy. After the Bolsheviks seized power in October 1917, Lenin quickly issued the Decree on Land, which transferred all privately held land to peasant use. Ironically, this order demonstrated the central government’s impotence, as peasants had already seized most private land by October. Lenin’s land decree presaged the battle for control of the rural economy that became a key feature of Russia’s civil war. The history of Russia’s rural revolution is still being uncovered, and what we do know of it makes for a far richer view of Russia in 1917. Sarah Badcock is an associate professor of history at University of Nottingham, specializing in imperial and revolutionary Russia, and in the history of punishment.